With all the “talk” about Wildomar becoming a sustainable community I have decided to do my small part and walk the talk. 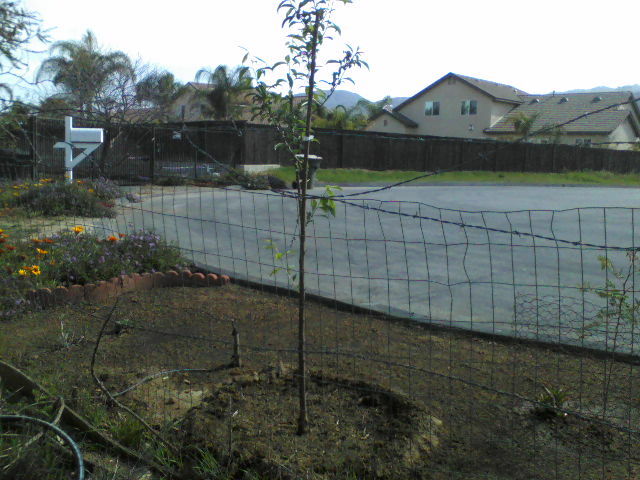 Copying an idea from the Los Angeles area I have planted a Santa Rosa Plum tree in the parkway in front of my home. The idea is that when this tree starts bearing fruit anyone walking by is welcome to help themselves to the bounty. Over time I will add to this unused portion of land several varieties of fruit bearing trees and vines, being mindful of the location of the utilities buried beneath it, in hopes of having a year around supply of “Public Fruit” available. I may also add a bench so one can sit and enjoy the view along with the sweetness of the fruit. This entry was posted in Daily Ruminations, Future City of Wildomar on March 24, 2014 by Kenny. Great anxiety is felt in the West, and especially in Southern California, less the water supply will be insufficient to supply the demands of the increasing population and cultivation. The writer, however, believes that the winter of 1903-4 will remedy this apparent coming water famine and that thereafter for a period of ten years water will be as plentiful as from 1884 until 1894 – for the following experience and reasons: In 1883 I purchased La Laguna Rancho, in the northern part of San Diego county, and established the town and colony of Elsinore. At the time the Elsinore lake, known as “Big Laguna”, or “Laguna Granda” was almost entirely dry and covered a surface of less than 4000 acres. The whole section of Southern California was having a water famine, which had been gradually creeping on for about 10 years, and the wisest of our horticulturists were uneasy and really alarmed for the future water supply. During the survey of Elsinore colony, from July, 1883, until January, 1884 the lake was rapidly disappearing at a rate of 4 inches per day, and the permanency of the “beautiful mountain lake” which was being so industriously advertised, became a serious question. About the first of January I noticed some wild water fowl, apparently sitting in the air near the (then) middle of the lake, and, taking a small canvas boat, found the branches of a treetop sticking out of the water. After cutting these limbs off below the water level and sounding the bottom I found a sink of at least ten acres, which was about forty feet deeper than the balance of the lake bed, containing large dead willow and cottonwood trees, standing upright just as they had evidently grown. This of course, gave occasion for greater alarm. Upon the grant there still lived the grand old Don Juan Machado, who was then the oldest living of the illustrious family of Californians of that name, who had occupied the rancho for many generations, and to him I at once repaired for information. After establishing a proper standing of sociability and confidence the honest and truthful old gentleman gave me what I believe to be an accurate history of the water supply for the last four hundred years, which had been kept by the family and gathered from the Indians and their histories and traditions – many of which are still written in symbols on the great smooth granite slabs and boulders around the lake, at Temecula, Warner’s ranch and other parts of the county. Not knowing my own discovery of trees in the lake, he described it all accurately, and said that: “Every twenty years great floods came and filled the lake full of water till it ran down the Temescal, to the Santa Ana, making a great river.” He said “it was always just twenty years from the time that the floods came until they came again, and it never failed but once.” That “once when his own grandfather was a boy and the lake dried up, the floods did not come, and did not come again until the next twenty years; that there was a great hot spring in the center of the lake (pointing out the exact location correctly). Containing many acres around it, which was a great deal deeper than the lake bed, and that during the twenty years, while it was dry, great trees grew there; that they were still covered in deep water; that he had once seen them himself, sixty years before, when the went almost dry.” He said: “You will soon see them stick out, but not long, because the flood will soon come. This is the year they are to come. It is just twenty years. Then he showed me how the trading rats built away above highwater mark and we drove down the Temescal for twenty miles or more, observing this and a number of his other signs of wet weather, and a few days later drove to Temecula where the old German merchant, Louis Wolf, and the old Mission Indians corroborated his information. He was very much chagrined as day after day passed and the limbs of the trees did not show, until I explained the reason and the reason why I did not want the Americans to see them. We lived within a stone’s throw of each other – he in the old homestead and I in the old English ranch house – and one evening, about the middle of January, 1884, when I drove into the barn and was unhitching my team, he came over to me wearing a broad smile. Pointing to the top of the mountains, south of the lake towards the sea, he showed me a line of fogs or clouds rolling over the top and melting away, which he explained were the forerunners of the great floods. Sure enough, the next day at noon it began to rain and before the end of the wet season it had rained 62 inches on that side of the lake, and 50 inches in the new town of Elsinore, on the northeast side. During the month of February we did not get a glimpse of the sun from the ranch house, and the lake filled, making the “beautiful mountain lake” an established fact for a least a dozen years. These experiences and histories having come under my observation during the past twenty years, has fixed in my mind a belief that the floods occur in Southern California exactly every twenty years, and that, therefore, we will need to be very careful of the water which falls the coming winter, and see that none of it shall be wasted by running to sea. 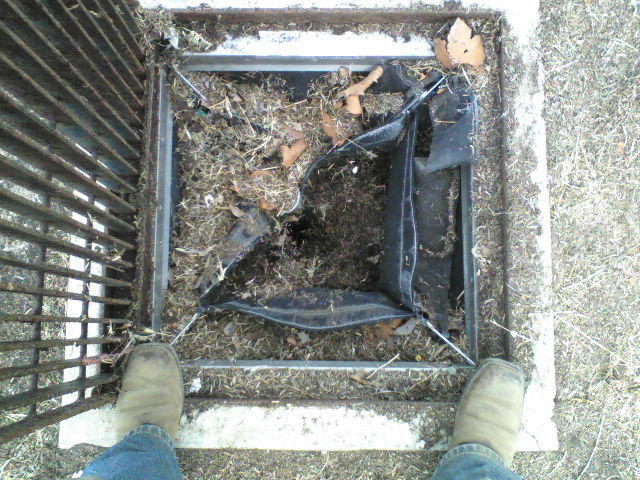 The best way to store it is by winter irrigation. If it could be run out over the dry valleys and stored in the ground it would keep up the supplies below, during the next summer. It can be used any number of times between the mountain foothills and the seashore without injury, as it purifies itself by soaking through the soil. The best and cheapest reservoirs the government could possibly construct would not be dangerous dams in the mountain regions – but large winter irrigated farms on the higher lands. Keep them soaked full of winter rains; take out distributing ditches below wherever the water soaks by into the stream and keep on doing it and thus be sure no water runs into the sea, as long as there is room for it in the cultivatable land below its source. 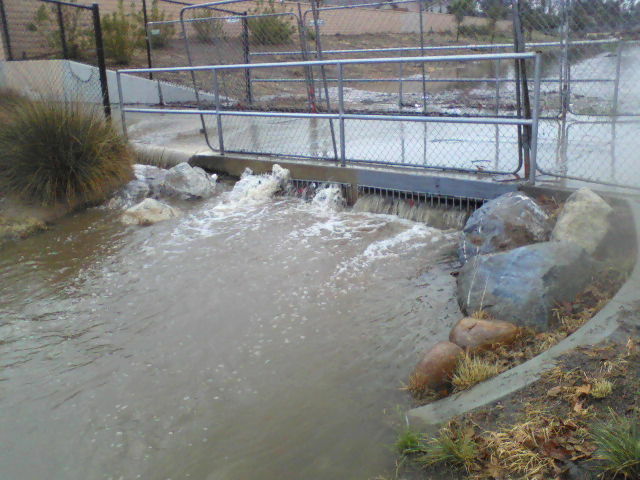 This entry was posted in History and tagged Drought, Elsinore, Flood, Franklin Heald on March 18, 2014 by Kenny. 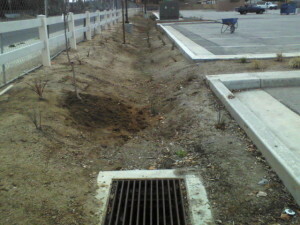 Something as simple as a dirt trough is so indicative of the past and the future of Wildomar. The reasons for the exclusion and later inclusion of this feature are many fold. Regency Heritage Park After the bridge, water forced over due to accumulation of debris. leaving the citizens inside of the RDA to foot the bill for 30+ years. The counties response – there close to the redevelopment area, no problem. During the reconstruction of the parks, that the citizens closed when they defunded the previous parks district, the county paid no heed to any of the requirements of the California Water Code and totally ignored the California Regional Water Quality Control Board San Diego Region (Region 9) by failing to implement a Standard Urban Storm Water Mitigation Plan (SUSMP) or to even notify the Regional Board of this project when asked directly, on two occasions, if there were any projects started since 2005. 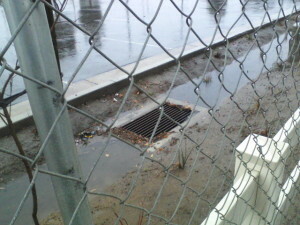 In response to a Notice of Violation issued in July of 2008, the County of Riverside after receiving a date certain by which a response was required, danced, telling the Water Quality Control Board they would install a bio-swale to cleanse run-off from the parking lot , install fossil filters and screens in the drain openings, stencil parking lot storm drains with “Only Rain in the Drain” signage and post educational materials pertaining to the Santa Margarita Watershed for public awareness on a bulletin board located at the concession stand/restroom complex. There are several problems with this response. 1. Marna O’Brien Park is located in the Santa Ana Watershed, which some of us locals have known since 1984. This issue was maybe unknown to Riverside County and definitely unkown to the Region 9 Water Quality Board until October of 2008. I say maybe unknown to Riverside County because the drainage system is attached to the Bryant Street Storm Drain System which flows into Lake Elsinore after passing thru Regency Heritage Park. Because of this watershed issue Region 9 allowed Riverside County to not face fines from Region 9 at that time, referring the issue to Region 8 which failed to act. 2. Riverside Water Conservation District did not have a pollution criteria index for parks, instead the criteria for “Detached Residential Development” was used per the County of Riverside’s response. Riverside County has had a Parks District since 1926 and a Water Conservation District since 1945 and yet there is no criteria for parks. Really ? 3. Although a Bio-Swale was constructed it has fallen into disrepair and to date the city has failed to properly replant it rendering it total ineffective. Not much natural filtering going on here. 4. The County of Riverside never marked any of the drains nor did they erect any bulletin board displaying the educational materials promised. 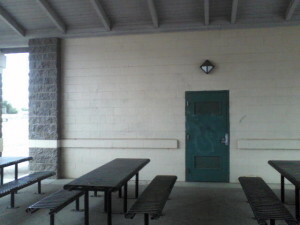 Same blank walls exist all they way around both buildings. The City of Wildomar was in the process of taking control of the parks from the county at the time all of these events were going on and either ignored these events or failed in their due-diligence to learn of this Notice of Violation. After having been made aware of it several months ago none of these issues have been properly addressed. The filter on February 26th before the most recent rains on February 28th. Parking lot flooded during rains of February 28th. 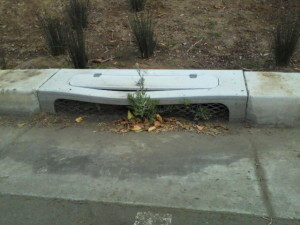 The City of Wildomar is unable and unwilling to address a simple item for which they have the funds to correct, yet we are to believe they can go on to manage a possible park in a retention basin, construct bikeways along Grand Ave and Clinton Keith (which will require numerous bio-swales due to the amount of impervious surfaces being added to the city) all of these with no monies for maintenance, good luck with that. This entry was posted in Future City of Wildomar, Parks, Shenaigans, Water and Drainage Issues and tagged Bio-swale, LAFCO, Parks, Riverside County EDA, Wildomar on March 17, 2014 by Kenny. Sorry about the short notice but I just received this information by way of Wildomar’s “Stay Connected” this afternoon. See the attached flyer which is in English and Spanish. This entry was posted in Uncategorized on March 14, 2014 by Kenny. 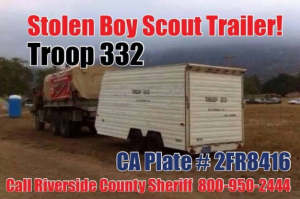 The Wildomar Boy Scout Troop 332 had their trailer stolen over the weekend. 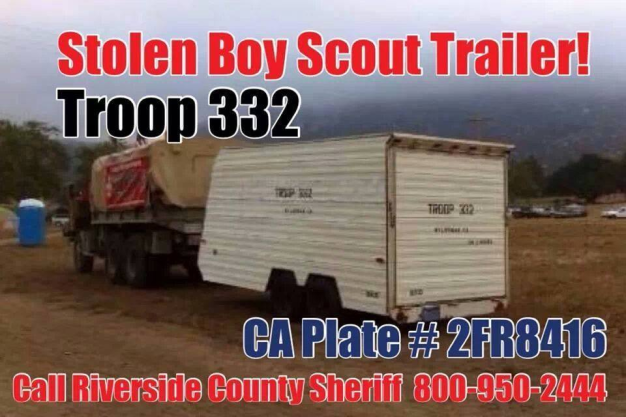 Please keep an eye for it and call the sheriff’s department if you should happen to see it in your travels about town. This entry was posted in Shenaigans and tagged Boy Scouts, Stolen, Wildomar on March 12, 2014 by Kenny. While reading over the Wildomar City Council Agenda for the upcoming meeting on Wednesday March 12, 2014 I came across Item 2.2 Appeal of Minor Changes to Tentative Tract Map 25122 CV Communities along with Item 2.3 Appeal of Minor Changes to Tentative Tract Map 32078 CV Communities. While reading the reports submitted I got to wondering about the fill dirt (a reported 245,000 cubic yards) that is currently onsite and wether any government official knows where it came from. This is important in light of the problems associated with the Autumnwoods Estate development. When one looks at the aerial photographs on the County of Riverside Land Information System for 2004 one notes there is no Autumnwoods Estate Development and no fill dirt on the proposed tracts located at McVicar and Palomar (formerly Rancho Fortunado). In 2007 Autumnwoods Estates is completed and a large mountain of fill dirt is forming on the tracts in question. During previous discussions at planning commission meetings the question was asked about this imported dirt and where it came from. These questions were never really answered except to point out that a previous developer who is no longer in business brought the dirt to the site before Wildomar became a city. This in no way should alleviate the City of Wildomar’s responsibility in identifying where this dirt came from. If no records exist then this dirt should be ordered removed in its entirety and the new developer should start from scratch to bring in new dirt with a known origin after testing the site left over after removal. 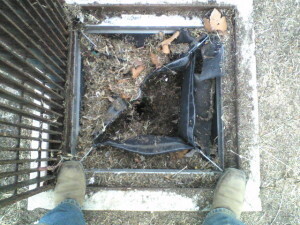 Some may say just test the fill dirt, the problem is all it takes is a very small amount of dirt to contaminate the whole lot. 245,000 cubic yards of fill dirt assuming it hauled in 20 yards at a time in a set of double trailers takes 12,250 trips and all it take is one load to contaminate the whole site. This entry was posted in Daily Ruminations and tagged Autumnwoods Estate, McVicar, Wildomar on March 11, 2014 by Kenny. There are two games scheduled today at Welch Field starting at 12:30. Please park in the lot between the cemetery and ball fields. More about this exciting day with pictures later. 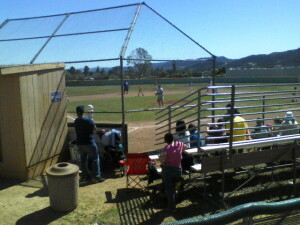 Just returned from watching some little guys having a good time playing some baseball. Here are some pictures. 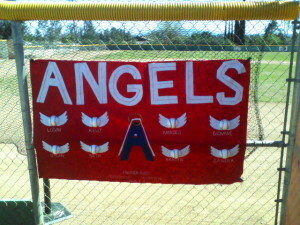 A team banner. The other team was the Padres. A fair size crowd in attendance. This entry was posted in Parks and tagged Little League, Welch Field, Wildomar on March 8, 2014 by Kenny. This is the press release that apparently some of the people signed up with the city e-mail alert received and some didn’t. This entry was posted in Uncategorized on March 7, 2014 by Kenny. Was thinking today about all the problems with getting the parks open in Wildomar and recalled a recent project proposed by the City of Wildomar in their 5 year Community Improvement Program for what is being called Gateway Park. This is a proposed park at the corner of Malaga Rd and Mission Trail that is a pet project of the City Manager for the City of Wildomar with a proposed budget of $100,000 assuming that the city can acquire the property from the County of Riverside for $0. The entire purpose of this park is to make the City of Lake Elsinore move their “Welcome to Lake Elsinore Sign”across the intersection into the City of Lake Elsinore rather than being located in Wildomar which seems to really bother the city manager to no end. Rather than spending $100,000 on this ridiculous make believe park project would it not be more feasible to spend this money on getting a joint use agreement and fixing up the playground area at Jean Hayman Elementary School to utilize as a real park for the residents of North Wildomar, especially since this closed facility has access to reclaimed water which was brought there after the school was closed. Might even make sense to spend the money cleaning up a former park located at Gafford Rd and Great Falls Rd. 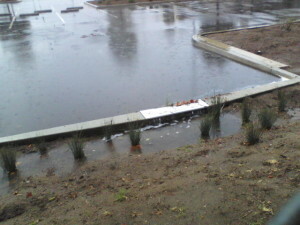 which is located in a retention basin former controlled by Ortega Trails. 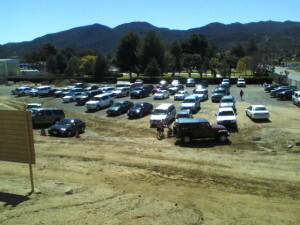 The cement pad for a basketball court is still there in this all but forgotten area of Wildomar. 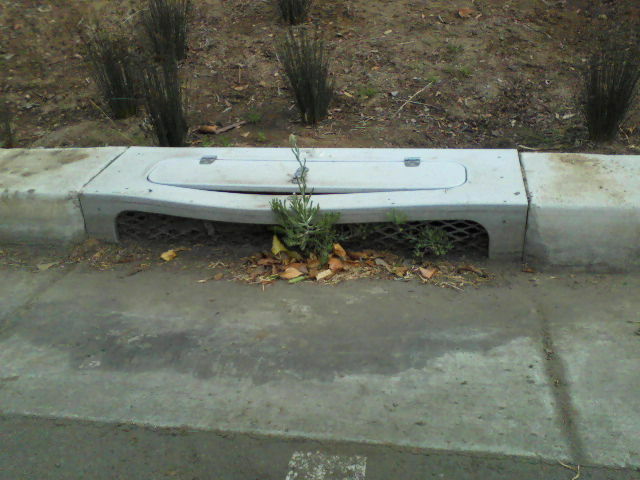 This entry was posted in Daily Ruminations and tagged City Manager, Parks, Reclaimed Water, Recycled Water, Wildomar on March 7, 2014 by Kenny.